The species has widely scattered records as far north as West Ross. It is widespread in western and central Europe. 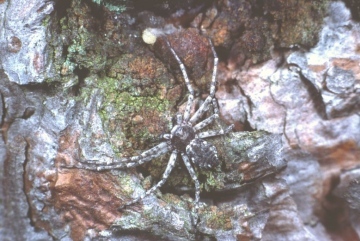 The spider occurs on pine trees, occasionally on heather (probably near pines), mainly in heathland areas. One female has been found guarding an egg-sac under a stone on river shingle in Caledonian pine forest (I. Dawson). It is adult from May to July. The spider is known from only six locations since 1992. It is very local and appears to have undergone major long-term decline. Area of occupancy has apparently declined by 70% since that time. The clearance of semi-natural Scots pine for intensive forestry plantations might be detrimental for this species.